Dammit the girls from Wildfox know how to put together an amazing campaign. Beautiful styling, incredible photography, super gorgeous models the creativity is always running wild..
Loving wild fox statement tee's! the first shot and that poncho are just fantastic! AMAZING! They get it so right every single time!! Absolutely love all of it. Such a great campaign. such beautiful shots! she's so perfect for wildfox. That pink lipstick is just heaven! You r right great campaign!!! loving it. those pink sunnies are so lovely, and she is such a great model. Aaah wow this is just stunning, all the clothes seem to suit the pink hair so well! pink hair, pink lips, pink clothes.. so great. love CF and these shots! charlotte free is the most beautiful model in the world. dying over her face and hair, she looks incredible in these photos! so suitable looks for her! Amazing photos. I lov the atmosphere they have and this beautiful model with rose hair. Just dyyyiiing looking at Charlotte Free, she's everywhere at the moment - just love the personality she brings to an editorial. 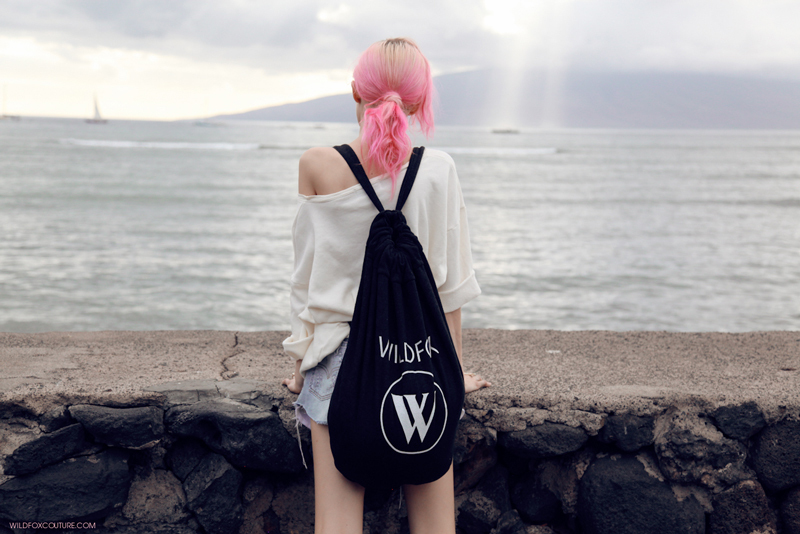 Seriously want that Wildfox backpack too. she's so cute and beautiful!! i loveeeeeeeeee this photos!! Amazing campaign and pictures! And how cute are these clothes and colors! That pink hair against the pale blue sky and sea is just perfect! Amazing...love to see Maui as a backdrop too!